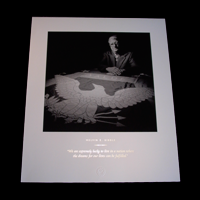 The Collection represents the most comprehensive body of work ever created in United States military history of heroes who symbolize the patriotic spirit of America. Only 35 numbered portfolios remain. The Collection was created by Nick Del Calzo in collaboration with the Congressional Medal of Honor Foundation as a companion project of the best-selling book: Medal of Honor: Portraits of Valor Beyond the Call of Duty. The Collection consists of 156 contemporary portraits of Americans who were bestowed our nation’s highest award for valor in combat. These black and white photographs have been installed as a permanent exhibition at the Pentagon as a “one-of-a-kind” addition to its historical holdings. This collection was also gifted to the U.S. Naval Academy and the U.S. Air Force Academy. Each portfolio comes in 20 x 24-inch format and is printed on the finest paper available. Because of the historical significance, each portfolio is produced in accordance with the highest museum-quality and archival standards. 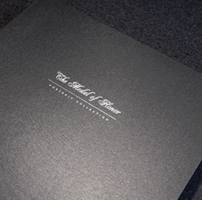 The Collection arrives in a custom-made, foil-stamped portfolio case.